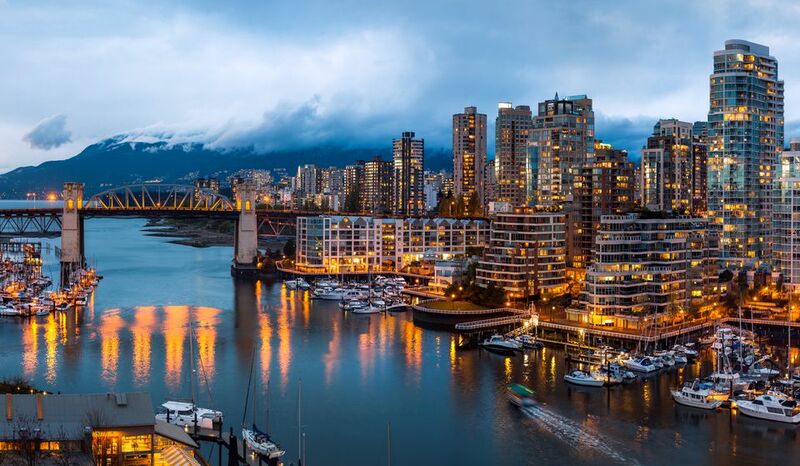 The best time to visit Vancouver is typically in the summer when you'll have warm, sunny weather—especially since Vancouver's rainy season can last long time, starting in October and ending in June. But summertime also brings more tourists and higher prices. If budget or crowds are a concern, the next best time to visit would be in one of the shoulder seasons. (Shoulder seasons refer to the periods before and after the summer peak season—they may not be as reliable weather-wise as the summer, but they do offer a more affordable and quieter option for visitors to Vancouver.) In Vancouver, these are typically in late spring during April and May and during the fall in mid-September and October. Vancouver's off-seasons include November to mid-December, January (the most off-season month of the year), and February to mid-March. The greatest variable with Vancouver is the weather. The variable weather (which is really an issue all year) can make a trip less fun. April, September, and October are all typically rainy months, and temperatures can vary from average highs around 16ºC / 61ºF to average lows around 12ºC / 54ºF. Weather may affect your enjoyment of outdoor activities. Some folks are happy to hike and bike whatever the weather, but if enjoying Vancouver's outdoor activities is high on your list, and you know you won't enjoy them as much if you're too wet or too cold, then paying more for summer peak season may be wiser. There are two immutable negatives to the off-season in Vancouver (and they're the same ones locals who live here complain about): weather and short days. In comparison to the rest of Canada, Vancouver actually has a very mild winter. It's rare for it to snow in the city, and if it does snow, it's unusual for it to last on the ground more than a few days. It's also much warmer than most of winter Canada; Vancouver's winter lows are around 1ºC / 32ºF (highs are around 6ºC / 42ºF), above freezing. A winter coat is sufficient; you don't need special boots, gloves, or gear to be out and about in winter in Vancouver. It's cold, wet, gray, and cloudy most winter days, and it's also dark. Vancouver has limited daylight in the winter months. In December, for example, the sun rises around 7:40 a.m. and is down by 4:30 p.m. Yes, it is full, nighttime dark by 5 p.m. This continues through January and February. If you're dining and shopping and going clubbing, the 4:30 p.m. darkness is not a big deal. But if you want to see Vancouver's best viewpoints or visit Vancouver's most Instagrammed landmarks or do anything that involves daylight after 5 p.m., then off-season may be "off" for you. There will be shorter wait times at U.S.-Canada border crossings and airports during the off-season. Attractions are open year-round, and you can enjoy them in any weather (especially the indoor ones), but note that there will be more crowds in summertime, so for popular attractions, plan further ahead and book reservations or buy tickets in advance if possible. Off-season is the ideal time to visit Vancouver museums and galleries and to enjoy Vancouver theatre, shopping, nightlife, and dining, since you can do all of those things regardless of the weather and crowds will be minimal. A warm May or September will provide all the benefits of summer's peak season while hotel and flight costs will be (at least a little) lower, and there will be fewer crowds. There are many cost benefits to off-season travel in Vancouver. According to The Vancouver Sun, travelers can cut costs by 25 percent by traveling in the off-season. Lower occupancy rates at hotels means more options and lower prices. (For example, a $300 room in peak season could cost up to $200 in off-season.) The same pricing trends hold true for sharing economy accommodations like AirBnB and VRBO, which means more options for longer stays or for staying in Downtown Vancouver. Airfare into Vancouver may also cost less in the off-season. April is typically cool and rainy, but has whale-watching and spring gardens. May is a wonderful time to visit for foodies: there are the annual BC Spot Prawn and BC Halibut festivals, which inspire restaurants to create fresh spot prawn and halibut dishes, and the famous Asian-style night markets in Richmond open in mid-May. June is sometimes called ‘Juneary’ due to the rain, but generally, July and August are hot and dry with plenty of events and holidays, such as Canada Day, Vancouver International Jazz Festival, Celebration of Light fireworks and Bard on the Beach. Early September is often still warm, so it's ideal for outdoor activities while late September is perfect for touring fall foliage. In October, Vancouver goes all-out with a month of Halloween attractions and events, including "haunted" Vancouver tours and ghost tours. It's fun for pop culture geeks, too—the annual Vancouver Halloween Parade is all about cosplay. Late November and early-December have snow sports (weather permitting) and ice skating, plus Christmas attractions that open early. January is ideal for foodies: Every January, Tourism Vancouver hosts the two-week Dine Out Vancouver food festival, with multiple restaurant events, food tastings, and food tours. January is also perfect for bargain hunters who love to shop after-Christmas sales. February is perfect for a romantic getaway to Vancouver for Valentine's Day (many hotels and spas offer special Valentine's Day packages), or for combining a trip to Vancouver with a romantic getaway to Vancouver Island (where you can curl up together and watch winter storms).